﻿ How You Can Make Money With Steel Titan Scrolls In Runescape? How You Can Make Money With Steel Titan Scrolls In Runescape? While we are the best place online to buy Runescape Gold we also love to play the game. 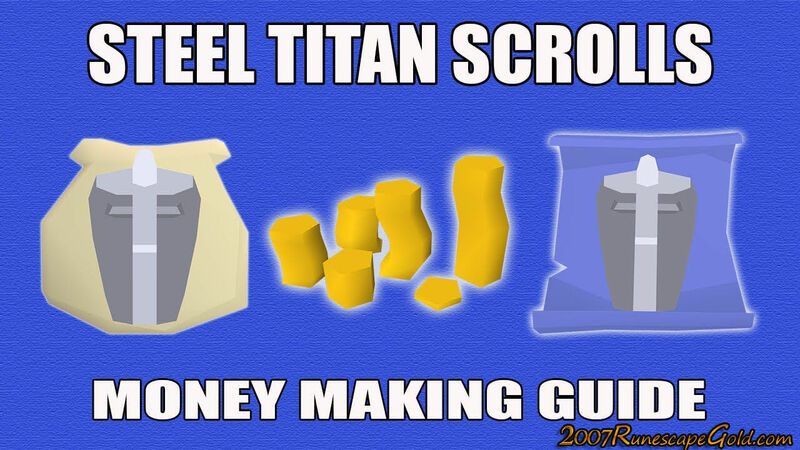 That is why today we are sharing with you how you can make money by utilizing steel titan scrolls in Runescape. You want to use your Attuned crystal teleport seed and go to Amlodd, which should be the third option on your list. Head to the west and surge, find the obelisk which is then to the south and converts. You should be able to make 720 scrolls each inventory, head to the bank and then go back and repeat the method. As of writing, you can make around 5.1 million per hour, but that is only if you have the Voice Of Seren, without it you are looking at about 3. It also requires a fair bit of cash up front and it is not the most fun money making method out there. We would say this is a money making method for those of you who are looking for something a little bit different and have a lot of money up front that they can use.